Merry Christmas! All my baking this past month has finally paid off. Baking for Christmas Eve and Christmas Day is the most fun for me because it’s my favorite holiday, the house gets all warmed up by the oven, I have much more time because of the break from school, and the house smells amazing from all the vanilla, sugar, and cinnamon! Last night I celebrated Christmas Eve at my grandma’s house, and today I will celebrate it at my Aunt’s. All the presents from last night plus this morning plus later today made me really appreciate all that I have. I plan to make the best of each moment today, and so should you. Here I have an easy and cute recipe for Christmas that everyone in my school went crazy over when I brought it in last year. I hope you and your families find joy and peace on this wonderful holiday, and the best in each of you comes out today; have a very merry Christmas! Tip: Let the cookies cool for 3 minutes and then press in the chocolate kisses and then immediately put them in the fridge. If you don’t, the chocolate kiss will melt on top of the cookie and not look pretty at all! (even though it will still taste good if you do accidentally mess it up a little). 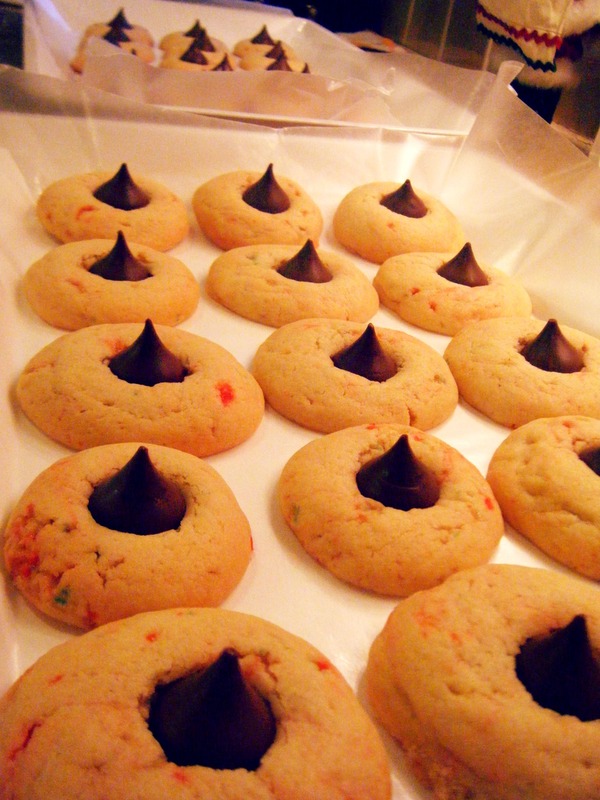 If you try to press in the kisses and the cookie is too hard, put them back in the oven for about 20-30 seconds until they get warm again. Sift flour, cornstarch, baking powder and salt into a large bowl, then whisk it just a few times, set aside. In the bowl of an electric stand mixer, on medium speed, whip together butter, shortening and sugar until very pale and fluffy, about 4 minutes, scrapping down the sides of the bowl as needed. Add in egg and mix until combine, then add egg white, vanilla and peppermint extract and mix until combine. With mixer running, slowly add in dry ingredients and mix just until combine. Transfer dough to an airtight container and refrigerate for 30 mins. Preheat oven to 375 during the last 10 minutes of refrigeration. Scoop dough out about 3 Tbsp at a time and roll into a ball. Place dough balls on baking sheet. Bake in preheated oven 9 – 11 minutes. Let cookies cool for 3 minutes. Immediately after press in Hershey kisses, and then put them in the fridge to cool. Take them out at least 30 minutes before serving.